Well….where to start? 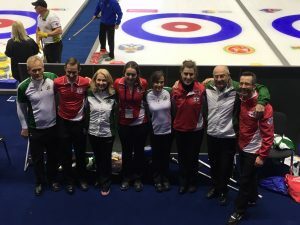 Team Ireland started solidly enough in this tussle with England with much more than bragging rights potentially at stake. A clean first end with the hammer after Jacqui and Ross had thrown good LSD’s ended with a single as Bill’s attempted blank didn’t quite roll out. We were struggling a bit with the weight as the game went through the next few ends until the 4th where after multiple missed shots, Bill faced 4 with his last and managed to draw round and although a little heavy came to rest art frozen taking three shots out of play. The English skip tried to clear for three but jammed our stone and we escaped with a loss of 2. Unfortunately the weight malaise continued and we struggled to impose ourselves at all and despite going to the last 5-5 we never really looked to be in a position to steal until late in the end but couldn’t make them play their last. A disappointing result but actually both teams agreed afterwards that neither had played that well. Onwards and upwards for the greens. Brazil next at 4pm so it will be colourful! !